Since 2001, Jim and Kathleen Ruddell have been serving fine smoked foods to locals and tourists on the beach in Cayucos. Located on the Ocean Front, you can enjoy tacos, salads and sandwiches filled with smoked pork, fish, or chicken. As a vegetarian option, a smoked black bean patty is available. There are tables outside or take your food down to the beach. Right next to the pier! Duckies is a great place to visit, relax and enjoy the flavor of a small California beach town called Cayucos. They serve outstanding seafood, sandwiches, beer and wine. But the chowder is everyones favorite! Conveniently located pizza parlor on the beach. Enjoy a slice or a whole pie! Embracing a nautical theme reminiscent of the early history of the Central Coast sailors and fishermen, Schooners boasts the best ocean views of any restaurant in the area. Gaze into the deep blue and enjoy your favorite cocktail with our famous calamari strips or ahi egg rolls. American and European Fine Dining. 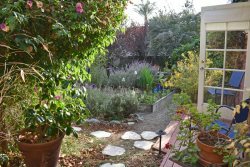 Take an enchanting walk in the hidden gardens of Cayucos. Dine in the pet friendly patio or inside with ocean views. Lunada Garden Bistro also serves a complimentary bottle of champagne for those of you that Sunday Brunch!